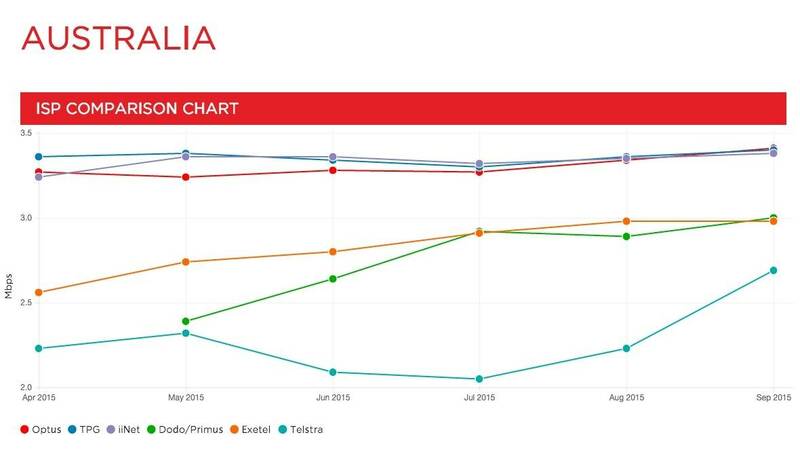 Optus takes crown from TPG by the barest margin but Australia lags Mexico, Chile and New Zealand Telstra has improved its Netflix download speeds by .46 of a megabit per second, but is still the slowest of the Australian internet service providers the video streamer rates. Netflix today released the September version of its ISP Speed Index, an index that measures prime time download rates. And a pretty picture of a few months' data. Telstra's tried to explain its poor performance on the index as an artefact of its enormous customer base in out-of-the-way places, among other factors that slow its delivery. The carrier's never mentioned that it is a half-owner of Foxtel, which has plenty to lose if Netflix becomes popular. Whatever the politics of Netflix versus Foxtel, Telstra's found a burst of speed from somewhere, jumping from 2.23 megabits per second to 2.69, a decent upwards hop. Optus has taken top spot, reaching a new point for any Australian ISP of 3.41 megabits per second. TPG is a whisker behind at 3.4 megabits per second. Telstra's 2.69 megabits per second still leaves it behind cut-price competitor Dodo, which clocked in at 3.0 megabits per second. None of the results but Australia's speeds aren't terrible on a global scale either. As Netflix's world speed index shows, peak speeds in the USA are 3.75 Mbps, the UK tops out at 3.99 Mbps and the fastest Netflix downloads in the world are to be found in Switzerland at 4.54 Mbps. Having said that, no Australian ISP can match the best results on offer in Chile, Mexico and New Zealand, nations Australia would not consider economic peers.